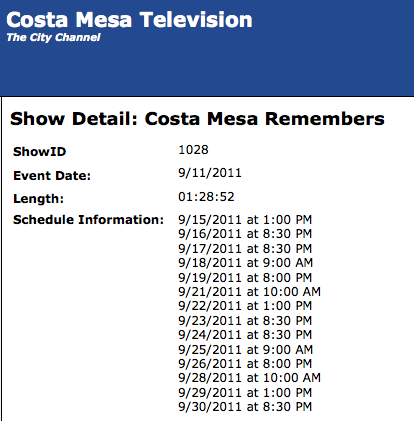 Today, at 1:00 p.m., Costa Mesa Television, Channel 24 and 99 on ATT U-Verse, will begin running a 90 minute show recorded at the Costa Mesa Remembers Memorial service on September 11, 2011. I'm told this will also be available soon on streaming video at the city web site, but it's not up yet. Here's the play schedule for this program. Thanks to Brad Long of CMTV for putting this all together for those of us who could not attend the service. Late this afternoon the streaming video of this wonderful, inspirational event was made available at the City web site. You can view it HERE. 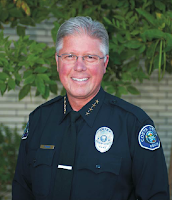 The Costa Mesa Police Department announced today that, beginning on September 27, 2011, it will begin charging a $10.00 fee to non-Costa Mesa residents to sign off on any correctible traffic citations. This charge will offset the cost of providing the service. Any correctible traffic citation can be signed off at the front desk of the Police Department, 99 Fair Drive, from 8:00 a.m. to 5:00 p.m. Monday through Friday, excluding all City-observed holidays. Costa Mesa residents will continue to receive this service free of charge, regardless where the citation may have been issued. A week ago today, while nursing the infirmities guaranteed by my most recent birthday and recovering from a little surgical procedure, I tried to watch my tape of the Costa Mesa City Council meeting from Tuesday, September 6th. The combination of needing to apply ice to my wound and the anesthetic getting flushed out of my system caused me to take twelve hours over two days to watch what was already an eight-hour marathon session. I blamed my impatience on my general discomfort as I watched that session, figuring I was seeing it through a drug-induced stupor. But, I've viewed it all again and changed my mind. I think I was impatient because this meeting may have been one of the most distasteful and frustrating I've observed in the past decade. I watche d as decorum on the dais took a vacation, the low-light of which was non-elected council member Steve Mensinger getting into a shouting match with speaker Greg Ridge. Ridge criticized Mensinger for voting, in a previous meeting, to give Costa Mesa Pop Warner Football $10,000 to pay a debt it incurred all on its own while Mensinger's wife, Robin, is an officer of the Pop Warner Board and responsible for fund raising. 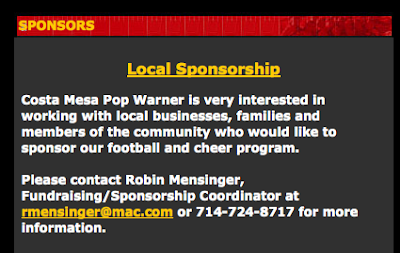 Steve Mensinger took exception to Ridge's comments, saying his wife WAS NOT involved in fund raising for Pop Warner. I captured that segment below. However, you can read two links that refute that argument. The link HERE, shows her named as a member of the Executive Board. The link HERE, identifies her as "Fundraising/Sponsorship Coordinator". These images were captured from the Costa Mesa Pop Warner Football web site yesterday, Tuesday. Clearly, Mensinger was peeved at being criticized for his part in the discussion of that $10,000. In my view, in that previous council meeting he should not have been involved in the discussion AT ALL, much less taking the lead in the request/demand for the money. He presented his version of the circumstances and there was nobody left on the city staff to refute them - all the other parties have either retired or moved on to greener, less hostile, pastures. 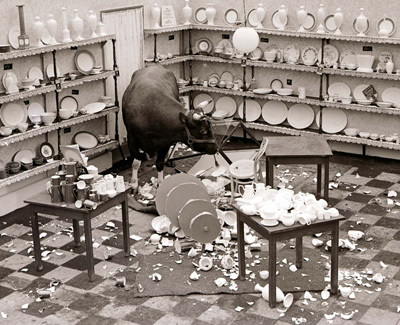 He bullied the council into paying a debt for which the city had no legal responsibility. I watched as Wendy Leece called-out Mensinger and Mayor Pro Tem Jim Righeimer for texting on the dais during the meeting. You can hear Mensinger file a "cross complaint" for criticizing him. Have I mentioned that he doesn't like criticism? You can watch that short segment below. Following that incident, which occurred early in the proceedings, I watched Mensinger go on frequent "walkabouts", wandering out of the chambers - maybe to make his phone calls and send his text messages - throughout the evening. It was so bad that at one point outsourced City Attorney Tom Duarte had to briefly call a halt to the proceedings because there was no quorum - another member had also wandered away! Later, during the discussion of the report from the Homeless Task Force, Mensinger pushed brand new Police Chief Tom Gazsi - on the job for about six hours - into a corner by demanding that he either provide a Park Ranger or a Security Guard at Lions Park immediately. Eventually, Gazsi guaranteed there would be a presence there "in a month". You can see that exchange below. 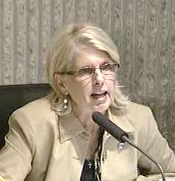 Later in the evening Mensinger hailed Costa Mesa City Employees As sociation President Helen Nenadal, who was sitting in the audience near the back of the auditorium, and TOLD her to get the air-conditioning fixed in Hatch's office because he was too hot in there recently. That request should have been directed to Hatch, and probably not in open session. Mensinger was just flexing his muscles, trying to show Nenadal who's boss - which he is NOT. The point here is that Mensinger constantly oversteps his authority on the council. As clearly stated in this extract from the Municipal Code, any direction to the staff MUST come through the City Manager/CEO - that's Tom Hatch. Some members of this council, especially Mensinger, have just elbowed Hatch aside and are providing specific direction to staff on a variety of issues. This needs to stop - immediately. Sec. 2-106. - Interference by council in administrative affairs. The city council and its members shall deal with the administrative services of the city only through the city manager, except for the purpose of inquiry, and neither the city council nor any member thereof shall give orders to any subordinates of the city manager; provided, however, that the manager and the council may vary the provisions of this section by the establishment of contrary policies. And hereby lies the problem. Mensinger, and to a similar extent, Righeimer, just don't get it. There are rules of decorum, lines of authority and established policies and procedures in place to protect the rights of the residents of our city. Those rules are designed to provide the framework for municipal actions. They both act like they can just make up new rules as they go along. Mensinger, in particular, is - in my view - temperamentally unsuited for the role of a public servant. I think it's that "servant" part that is the problem. He's used to having them, not being one. Look, I think Steve Mensinger is probably a really great guy. Clearly, he pl ayed a huge role in resurrecting youth football in our city - I've said that before. But municipal governance is an entirely different ballgame - pun intended. Yes, we need his business acumen and energy. Yes, we need his deep roots in the community. But, most importantly, we need him to understand that you can't just flail around like a bull in a china shop in City Hall, making unilateral decisions and causing damage to the very fiber of this city. He needs to quit spitting back at speakers trying to provide a opinion to him and the other council members. He needs to just calmly sit there and listen to the residents of this city. He didn't get 12,997 votes like Righeimer or 10,846 that young Chris McEvoy received last year. Mensinger got 3, one each from the three other men on the council. Perhaps if he'd had to walk precincts, gathering votes one at a time, instead of simply being appointed, he'd have a greater appreciation for the opinions of the voters. If he is to be an effective leader of this city he needs to learn to negotiate, not dictate. That learning process has started and we hope he's smart enough to understand it. Gee, I'm not sure what was more fun Monday night - watching Tom Brady surgically slice and dice the Dolphins (517 yards passing - nearly 400 in the first half!) - or watching the Planning Commission meeting - NOT! I confess I didn't spend too much time watching the Planning Commission, choosing, instead to watch one of the most fantastic games any quarterback has ever played, but did catch enough snippets of it to make a couple observations. First, I don't know what Mr. Green - commissioner Jimmy (Fitzy) Fitzpatrick - was nibbling on all night, but someone should remind him that, 1) food is prohibited in council chambers except for water and, 2) munching whatever it was on the dais looks bad and is just plain bad manners! Good grief! It's no wonder he's getting to be built more like me (and Shrek) every day! The low point for me was the discussion, led by Chairman Colin McCarthy, about clamping down on anyone, anywhere in the city who parks a "commercial vehicle" on the city streets overnight. No, he doesn't mean big rigs - cargo tractors, dump trucks, etc. Nope, he means the work trucks owned by practically every small tradesman in the city - carpenters, electricians, plumbers, gardeners, contractors, etc. He's apparently personally offended that those hardworking folks would dare to park the tools of their livelihood on the street beside their homes. It seems to me that Righeimer and Steve Mensinger's mantra about wanting to attract young families to our city somehow managed to miss the mark with some of their lemmings. What young family wants to move to a city that is institutionally sucking all the fun out of life here? Not many. For those who will not be watching the NFL double-header tonight, the Costa Mesa Planning Commission will hold its monthly meeting at 6:00 in council chambers. There are a couple interesting items on the agenda tonight in addition to the normal review of development proposals. Following the Code Enforcement Update the commission will hear about and review the staff proposal for the distribution of Garage Conversion Fliers, HERE. From all reports, the use of garages as dwelling units is a BIG problem throughout the city, but particularly on the Westside and other areas where apartments and multi-unit dwellings exist. The flier approach is the first step, and the most benign, of several others considered at an earlier meeting. Near the end of the meeting the commission will discuss a Wireless Telecommunications Ordinance, HERE, apparently spurred by the installation of a wireless telecommunication tower on the Eastside - about a block from my home, in fact. The discussion should be interesting, but nothing can be done about this tower - it's there already. The last item on the agenda is a discussion of Commercial Vehicle Parking on Public Streets, HERE. I'm not sure where this one came from, although Chairman Colin McCarthy gets "credit" on the staff report for dredging it up. It's unclear what he actually wants to do with this issue. I guess we'll find out tonight. 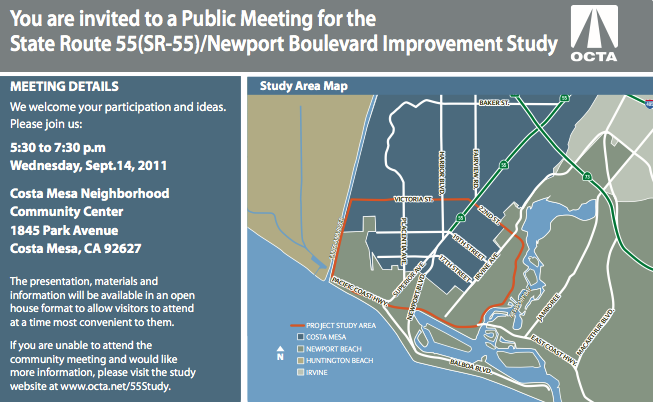 The City of Costa Mesa and the Orange County Transportation Authority are hosting a public meeting on the State Route 55/Newport Boulevard Improvement Study on Wednesday, September 14, 2011 from 5:30 - 7:30 p.m. at the Costa Mesa Neighborhood Community Center, 1845 Park Avenue, near the library at Lions Park. 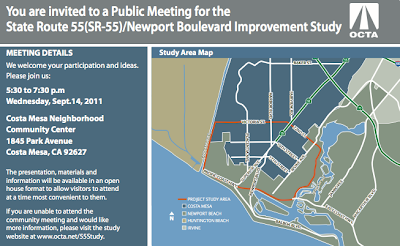 Staff members will be available to explain the exhibits available for viewing and the options for the possible improvement of this critical stretch of highway within Costa Mesa. Those interested are encouraged to attend this critical meeting and bring your questions. 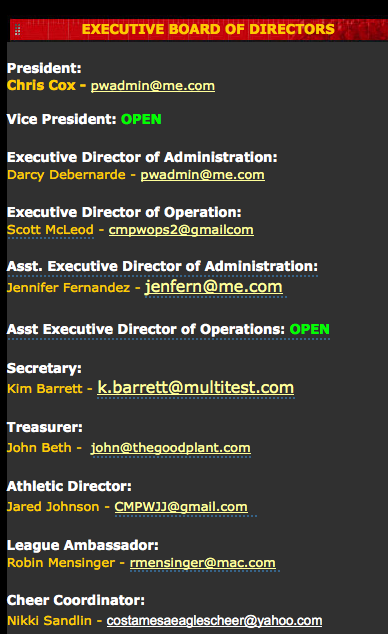 You can get more information at the OCTA site, HERE.